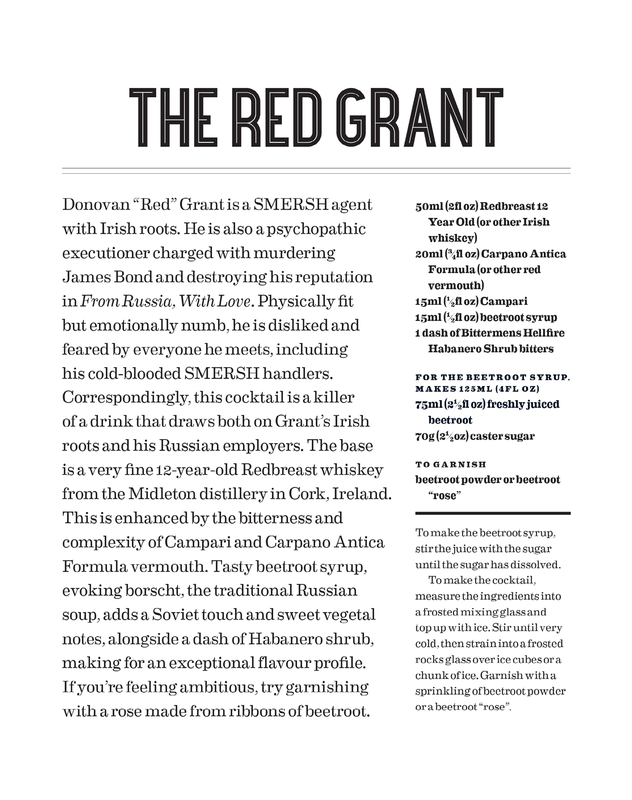 This weekend why not join us in sipping a cocktail inspired by one of the most sadistic Bond villains, Donovan ‘Red’ Grant. Grant is a henchman of SMERSH, sent by his Soviet handlers to destroy Bond’s reputation and claim his life in From Russia, With Love. An Irish orphan who learnt to communicate with his fists, nothing is as natural or as pleasurable to this psychopath than murder. 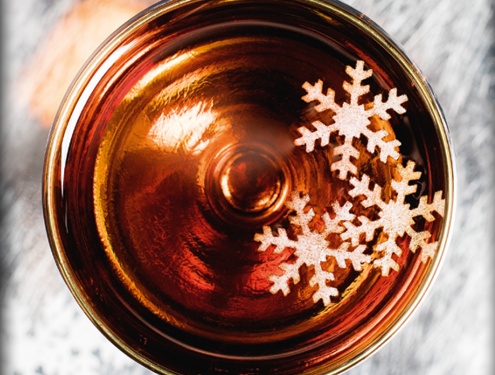 The cocktail combines Grant’s Irish roots with his Russian defection by mixing whiskey with beetroot syrup in a nod to the traditional Russian soup, borscht. 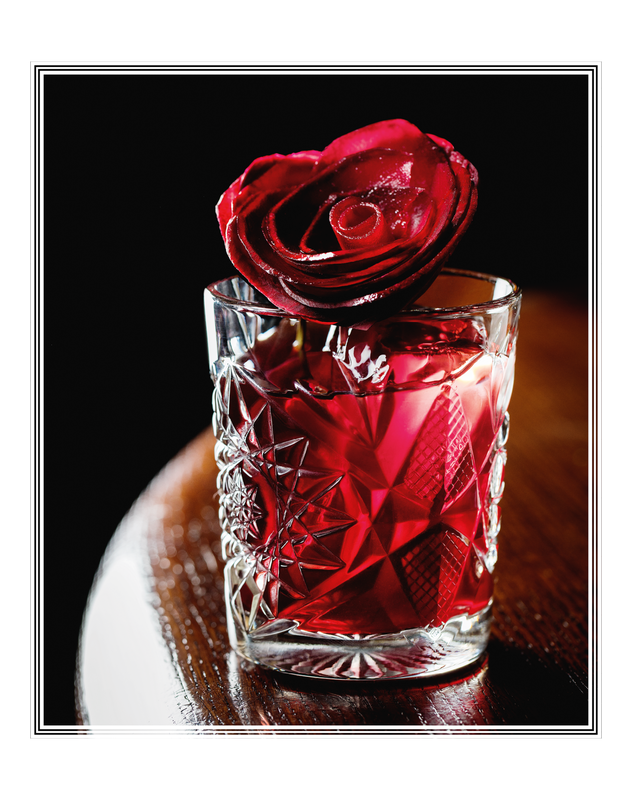 And if you fancy getting your hands dirty, we recommend garnishing the glass with ribbons of beetroot. Kronsteen slowly turned his head and looked at the door. Red Grant came in and closed the door softly behind him. He walked up to the desk and stood looking down, obediently, almost hungrily, into the eyes of his Commanding Officer. Kronsteen thought that he looked like a powerful mastiff, waiting to be fed. Red Grant showed no surprise. He took off his coat and, after looking around for somewhere to put it, dropped it on the floor. Then, unselfconsciously, he took off the rest of his clothes and kicked off his shoes. The great red-brown body with its golden hair lit up the drab room. Grant stood relaxed, his hands held loosely at his sides and one knee bent slightly forward, as if he was posing for an art class. Rosa Klebb got to her feet and came round the desk. She studied the body minutely, prodding here, feeling there, as if she was buying a horse. She went behind the man and continued her minute inspection. Before she came back in front of him, Kronsteen saw her slip something out of her jacket pocket and fit it into her hand. There was a glint of metal. The woman came round and stood close up to the man’s gleaming stomach, her right arm behind her back. She held his eyes in hers. Suddenly, with terrific speed and the whole weight of her shoulder behind the blow, she whipped her right fist, loaded with a heavy brass knuckle-duster, round and exactly into the solar plexus of the man. Grant let out a snort of surprise and pain. His knees gave slightly, and then straightened. For a flash the eyes closed tight with agony. Then they opened again and glared redly down into the cold yellow probing eyes behind the square glasses. Apart from an angry flush on the skin just below the breast bone, Grant showed no ill effects from a blow that would have sent any normal man writhing to the ground. Rosa Klebb smiled grimly. She slipped the knuckleduster back in her pocket and walked to her desk and sat down. She looked across at Kronsteen with a hint of pride. ‘At least he is fit enough,’ she said. The naked man grinned with sly satisfaction. He brought up one hand and rubbed his stomach. ‘Yes, Comrade Colonel.’ Grant was excited. Here was a chance for that big step forward. What would the medal be? The Order of Lenin? He listened carefully. 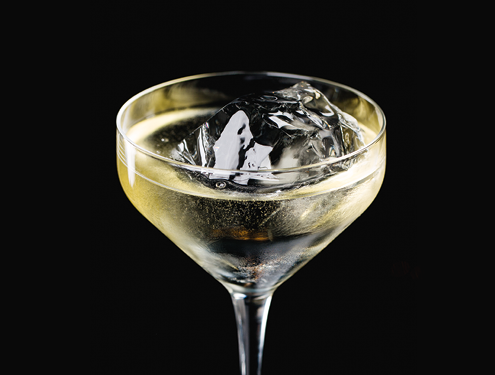 More delicious cocktails inspired by the pages of the James Bond novels can be found in Shaken: Drinking with James Bond and Ian Fleming. Purchase your copy here.